BCF : The city of Pitt Meadows is removing signs posted in one of its off-leash dog parks asking owners to keep their canines away from Muslim people. A number of flyers were recently posted in Hoffman Park asking dog owners to keep their pets leashed. “Many Muslims live in this area and dogs are considered filthy in Islam. 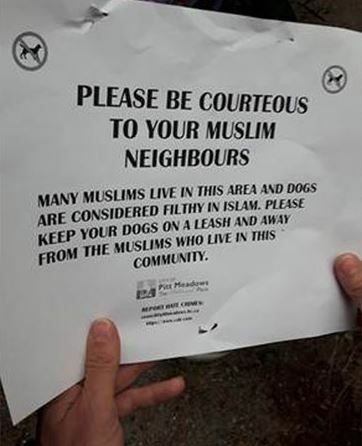 Please keep your dogs on a leash and away from the Muslims who live in this community,” the flyers read.